Since the formalisation of the Association in 1998, we have sought to adopt suitable community based charities to be beneficiaries of funds raised by us. As a non-profit sporting organisation we see this as an ideal opportunity for our members to give back some form of benefit to those less fortunate than ourselves. 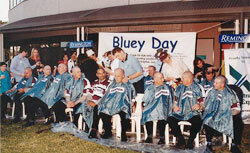 In 2001, our State Representative squad was used to launch the Foundation’s “Bluey Day” campaign by shaving their heads prior to the interstate game against the NSW Police. At the same time our boys donated $1,000-00 to the foundation. 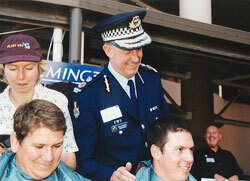 At the Brisbane carnival in 2002, the organising committee from the Brisbane Bulldogs collected money on behalf of the Kim Walters Choices Program. The Association chipped in, bringing the total raised during the carnival for this worthwhile cause, to $1,000-00. Also, at the State of Origin curtain raiser against the NSW Police, the Association gained approval from the QRL to conduct a collection at the main gates of ANZ Stadium for the Royal Children’s Hospital. In conjunction with the Bluey Day organising committee, this endeavour saw $3,794-40 raised for the hospital. Our Association also encourages each of our Regional teams to adopt suitable local charities within their areas for the same reasons, and the Queensland Police Service also encourages its members in this regard. Below is a break-up of monies/benefits donated to charity since 1998 by the Qld Police Service Rugby League Association and our members.